Child Care Basics Resource Blog: Let's Make Breakfast! 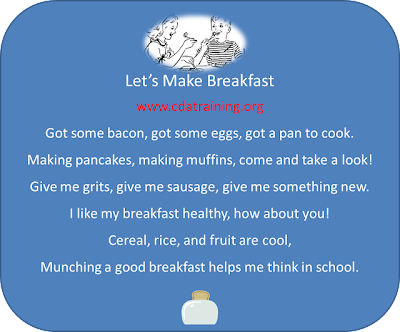 This is a teacher directed activity that helps children make sound nutritious choices for breakfast. 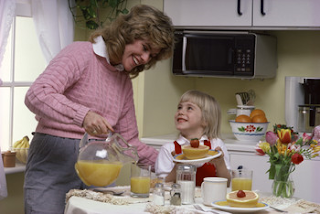 You may be surprised to find out what the children are actually eating for breakfast at home. Instructions: Tell the children they are going to help you decide what to have for a healthy breakfast. Guide the children in making the appropriate choices. Select a food item and ask if it’s part of a healthy breakfast, or a treat for special occasion. If it is healthy food put it on the diagram according to the food category: fruit, grain, vegetable, dairy, protein. If it is a treat put in a paper gift bag. NOTE: Some children have dietary restrictions, so provide alternative choices such as soy milk, etc.